There are two kinds of treatments available – those which work, and those which don’t. The real world isn’t so simple. There’s not a single treatment on the planet which “works” for every person who receives it. I’m sure the drug companies wish they did have such a product – it would have no competitors. Even treatments which work for most people, don’t work for ALL people. The placebo effect is distinguishable from a pharmacological effect. Randomised controlled trials typically have two groups. One group receives the study drug and the other, the placebo. If the improvements in the first group statistically exceed those in the second group, the drug is considered to be effective. However, the placebo effect occurs in both groups. It is impossible to know whether any individual in the first group has gained their improvements from the drug, and not from the placebo effect. In clinical settings, with any individual patient, it is impossible to know whether the drug has “worked” or whether the improvement is due to placebo. 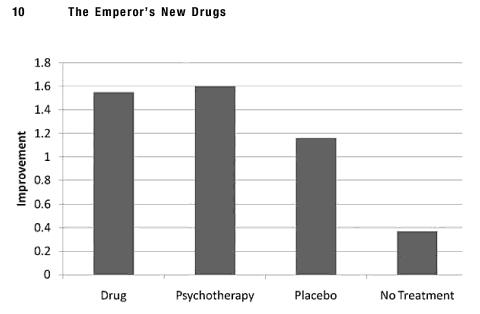 This graph is from Irvin Kirsch’s “Emperor’s New Drugs“. It clearly shows that placebo and doing nothing are not the same. The NHS only funds “evidence based” treatments. Health is a lived experience. Only a person can report that experience. To dismiss the patient’s narrative is bad medicine.